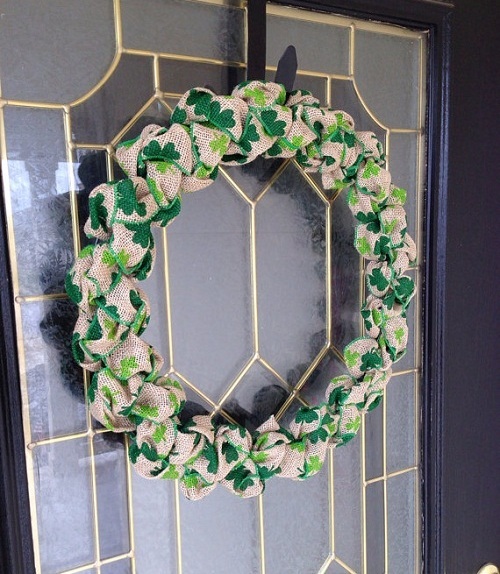 A shamrock burlap wreath to welcome in the St. Patrick’s holiday is great for your front door. 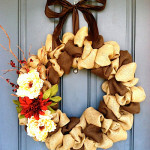 Make pretty basic ones, they are perfect for everyday décor; add some embellishments and they are ready for any holiday. The classic yet stylish wreaths are the perfect choices if you are thinking about decorating your home with some St. Patricks Day wreaths. 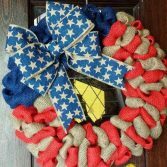 A shamrock burlap wreath for St. Patrick’s Day. 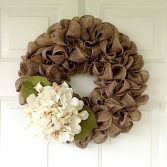 Wreaths made with green burlap and embellished with shamrock embellishments and patterned ribbon will be perfect for the occasion and add texture and interest to your beloved home. With scissors, cut the burlap lengthwise into several strips. Make the strips 4 or 5-inch wide. Take one strip and thread it in and out through each rim of the wire form while going back and forth. Make loops and tuck the ends in while overlapping them. Try to keep the size similar for each loop. Crease the loops together firmly so that the wreath looks fuller. Repeat this pattern for the rest of the form. See if there is any part of the form is visible. In that case, fluff out the loops and rearrange the burlap to conceal the wire form completely behind it. Cut the loose stray strands of burlap those are hanging around after tucking in the ends. 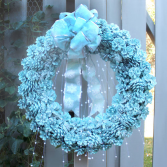 Cut one foot of the decorative ribbon and tie around the wreath for hanging. Hang it indoors, on your front door, or any shaded place outdoors! Attach shamrock embellishments, made of either paper or felt, to the wreath with hot glue to make it more beautiful and more thematic to the St. Patrick’s Day. These embellishments will be available at craft stores or you can make some of your own by drawing shamrock shapes on printed craft paper or felt and cutting them with scissors. 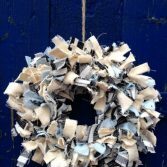 Don’t have time to make your own St Patricks day Wreath? 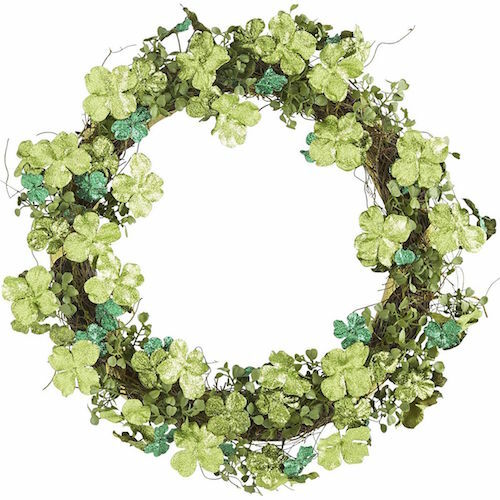 Pier 1 Imports features this Glitter St Patricks Shamrock wreath that would look perfect on any door! 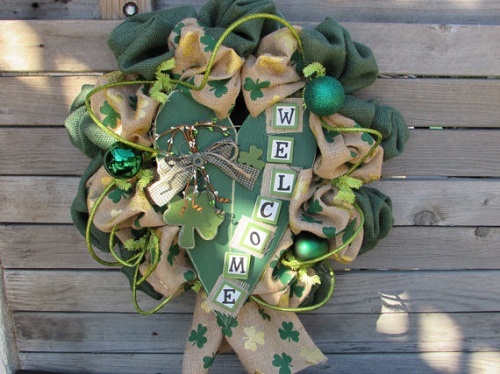 St Patricks wreaths are perfect for your front door! 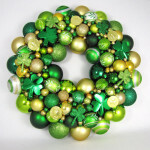 The wreath is so cute that it will make you think again even if you do not have any plan to do anything special for the St. Patrick’s Day celebration. In addition, it is fun and relaxing to add a touch of green to a spring celebration! 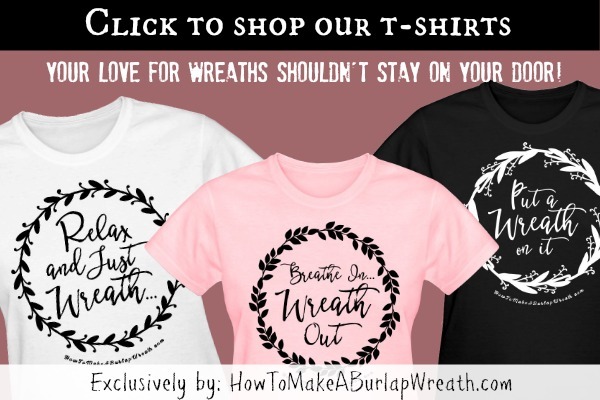 Hang the wreath any shaded place outdoors. 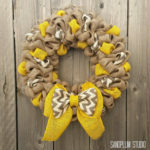 A burlap wreath always looks good, no matter how you decorate with it. 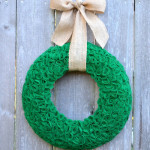 This St. Patrick’s Day bring the luck of the Irish to your front door with this beautiful St. Patrick’s Day burlap wreath!